Advent is PC World's in-house brand and provides a range of affordable consumer laptops. The Advent 6555 breaks the mould, however, by delivering high-performance quad-core power and multimedia abilities. One of only a few laptops to currently use Intel's Core 2 Quad processor technology, the 6555 effectively doubles the power of rival systems. Backed by 4096MB of memory, it is built for high-powered multi-tasking, and ably succeeds. While the MobileMark 2007 benchmark software we use is not yet optimised for quad-core processors, we clearly saw the benefits of the CPU in daily use. Applications load exceptionally quickly, and multiple complex applications can effortlessly run simultaneously. This level of power carries across to the graphics abilities. While the ATI graphics card used here isn't the most powerful we've seen, it is capable of running the latest games, and its strong performance and high-definition (HD) features make it a great choice for editing videos and photos. Further HD usability is added by the built-in Blu-ray drive. It is a read-only drive, so you can't write data to recordable Blu-ray discs. You can, however, watch the latest HD movie releases, and also read and write data to and from standard recordable CDs and DVDs. Unfortunately, HD usability is limited slightly, as the 17-inch screen doesn't carry a full HD resolution. Image quality is excellent nevertheless, but for the full HD cinema experience, you'd be better served by connecting to an external HDTV using the built-in HDMI port. 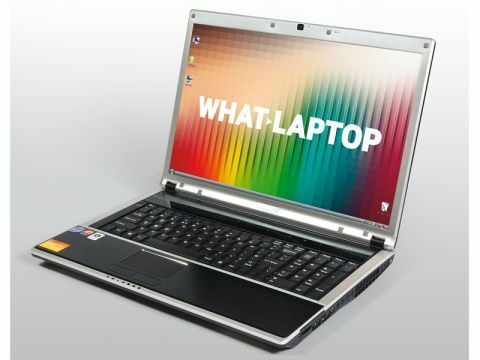 This is definitely a laptop for home use only, as the 3.5kg chassis and 175-minute battery life provide only basic mobility, despite the huge battery – which protrudes 20mm from the rear of the chassis – indicating greater mobile potential. Build quality and usability are strong, however. The brushed aluminium lid and palmrest add style and strength. The keyboard is comfortable to use, but rattles slightly when typing. Keys on the right-hand side have also been cramped to make room for a full pad of numeric keys. Rounding out the specification, the 250GB hard drive is ideal for storing multimedia files and running games from the disk. A subwoofer is also fitted below the chassis, adding bass to music and games, but we found audio quality not much better than on rival laptops. Although there are more powerful gaming laptops on the market, the quad-core power and HD compatibility of the Advent 6555 make it a strong media centre and ideal for multimedia fans with an eye for the latest technology.